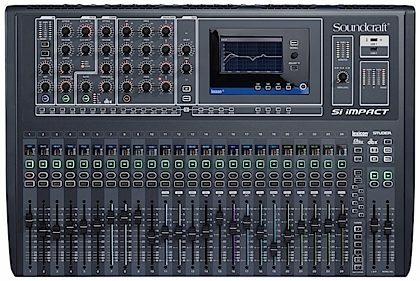 The Soundcraft Si Impact is a 40-input digital mixing console with a 32-in/32-out USB digital interface and iPad control. 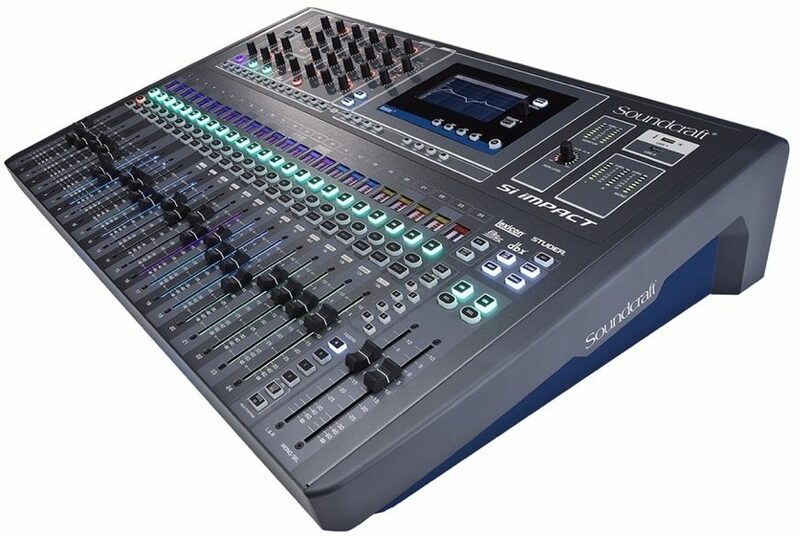 Designed to be as simple as an analog mixer, but offer radical workflow enhancements such as the unique FaderGlow system, massive DSP power, and a pristine 32-in/32-out USB audio interface, Si Impact delivers digital live sound mixing and recording for those who refuse to compromise on audio quality. Combining One-Knob-One-Function control with unique features like FaderGlow, Soundcraft combines analogue workflow with digital flexibility. FaderGlow illuminates the fader track in different colors to provide at-a-glance status information on precisely what the fader is controlling - aux sends, FX sends or even the graphic EQ that's available on every bus. Each fader channel also features a clear multi-color LCD display - giving 'at a glance' information on levels and offering a fully customizable scribble strip to name your channels. Si Impact isn't just packed with DSP power. It's packed with DSP power from the acknowledged experts in digital FX. That means studio-grade reverbs, delays and modulations from Lexicon, legendary dbx dynamics and industry-standard BSS Graphic Equalizers. Si Impact makes recording quick and easy with superb quality, built-in 32-in/32-out USB recording and playback - and a free download of Ableton Live Lite 9 is included. A single connection to your PC or MAC and you're ready to make multi-track recordings direct to any digital audio workstation. Send up to 32 inputs and 32 outputs to and from your DAW for recording and playback. 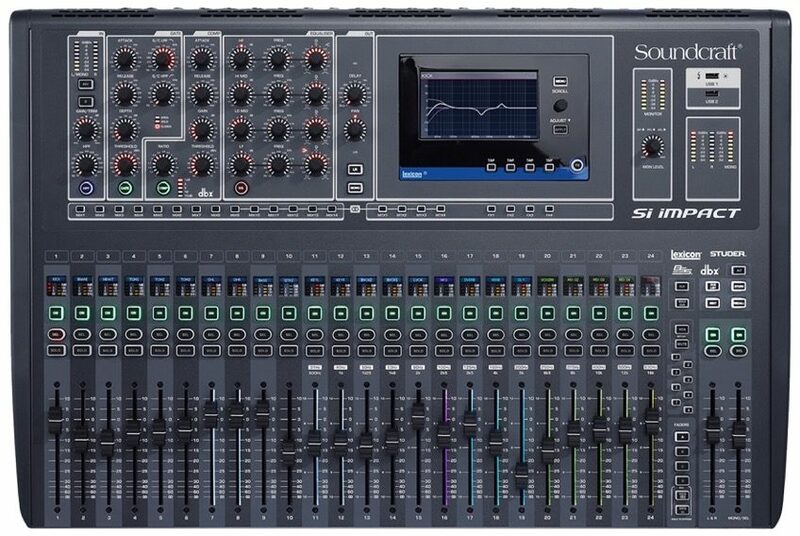 The mix power of Si Impact is accessible from anywhere in the venue, via the Soundcraft remote iPad app. Mix FOH from the audience location, mix monitors from the stage, or allow musicians to set their own monitor mix from multiple iPad devices. Overall: This board is beyond amazing And with the recent update doubling the input capacity. Wow It sounds just as warm as my analog soundcraft gear Very easy to use and the digital scribble strips are awesome. 7 of 11 people (63.64%) found this review helpful. Did you?